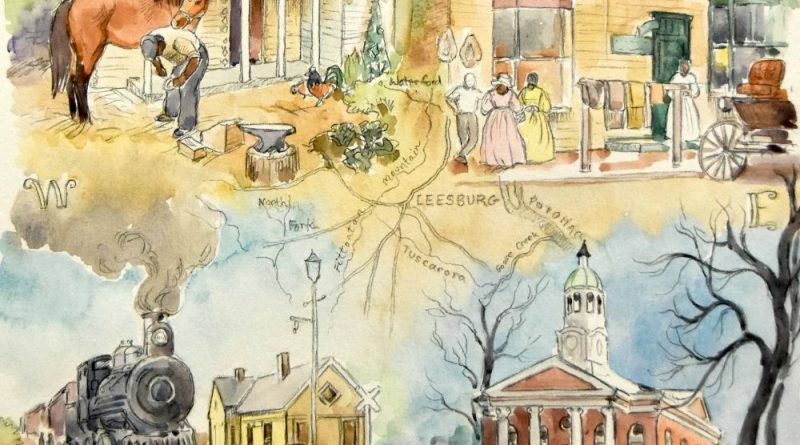 This mural depicting aspects of Leesburg's history will be installed on the Town Hall parking garage this spring. It was a great week for the Leesburg Commission on Public Art. On Tuesday, the Town Council signed off on its plans to install a train mural by Kaeley Boyle on the South King Street bridge at Georgetown Park. That work had already been reviewed and endorsed through several layers of public and administrative review. The council’s vote was the final step. In a surprise move, the council, during its Monday night work session, agreed to fast-track approval of a second mural request. Gale Waldron, a key leader in building Leesburg’s arts community, was an early advocate of public art and in 2007 sought to display a mural of Leesburg’s history on the side of her Gallery 222 building on South King Street. The request was made years before the town’s public art movement had much momentum. The Board of Architectural Board at the time ruled that the towns rules didn’t allow for such displays in the historic district. Waldron died Jan. 7. One of her final wishes was to give a piece of public art to the town. She donated a depiction of Leesburg’s history to be displayed on the Town Hall parking garage in the alley between Market and Loudoun Streets. Rather than debate the proposal and schedule a Feb. 27 vote, the council members agreed to give the project unanimous approval on Tuesday. The work is expected to be installed before the Flower and Garden Festival in April.